I admit that I had a lot of difficulty with this week's post. When I saw the book that was being spotlighted, I instantly didn't want to post it because I have a lot of trouble with people pushing religion (particularly the Christian religion) on other people. 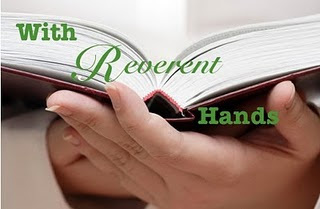 But at the same time, the whole point of With Reverent Hands is to push books on other people that may not otherwise have considered the book you love. And the below is certainly a book I would never have considered reading, but of course that doesn't mean it might not resonate with other people. And just because a reader recommends a book, that doesn't mean she is recommending all the strife and baggage that goes along with the religion. And I guess this submission proved to me that my issues with religion should not be pushed on other people- just as other people's religions should not be pushed on me. So thank you to Sumanam, the author of the below post, for bringing my fallacies to my attention. Sumanam blogs at I READ. There she reviews books by all sorts of people, ranging from South Asian authors to Christian fiction to memoirs. She has a very engaging blog and I enjoy visiting it for the wide range of books that I find reviewed there. She also has great giveaways, for those of you who enjoy contests and the like. I recommend checking it out! First in 1998, I saw the movie made by Martin Scorsese, after the movie I had to read the book. I mean if the movie was this good, the book has to be better, and I was not disappointed. Katzanzakis writes with a lusty sensuousness that fleshes out the New Testament characters with a vibrancy that is missing in the fairy tale writing style of the gospels. Along the way Katzanzakis places us inside the mind of Jesus as Christ struggles with his human nature and God nature in one body. Judas is the most sensate of the apostles and makes it obvious that he will not be satisfied with less than a sword-wielding warlord of a Messiah who will throw the Roman rascals out of Jerusalem and become an earthly King. When Jesus makes it clear to him that his kingdom will not be an earthly kingdom, Judas is the one who feels betrayed. The denouement comes when he meets his former disciples, and realizing how much he has betrayed them, wishes he were back on the cross, where he is transported instantly to finish his lamentation, ". . . Why hast Thou forsaken me?" Kazantzakis is a brilliant writer who looks at the world and perceives the intangibles around us like no other author I've ever read. His narrative is surreal, hallucinogenic and disturbingly earthy all at the same time. His ability to look into the human psyche and translate its intensely personal contents into concrete terminology is truly amazing. At times his writing seems more akin to poetry than composition. 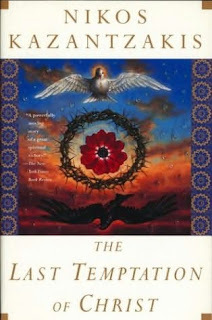 The Jesus depicted in this book is very human. He struggles with temptations and unpleasant situations. This book challenged me, made me think, and failed all my predictions. I like that this book is unpredictable but satisfying. This book really made me stay up late at nights until I finished it. I was in a book rut until I picked up this one. A riveting story. Oh and it will not bore you to tears, it's one of "those" classics! Please finish this analogy: If you liked _______, you'll probably enjoy this book. If you liked A Passage to India by E. M. Forester(though these are two different books, but it kind of reminds of each other), you'll probably enjoy this book. Thinkers..and those who (even if religious) open to new perspectives. "You will, Judas, my brother. God will give you the strength, as much as you lack, because it is necessary—it is necessary for me to be killed and for you to betray me. We two must save the world. Help me." Judas bowed his head. After a moment he asked, "If you had to betray your master, would you do it?" Jesus reflected for a long time. Finally he said, "No, I'm afraid I wouldn't be able to. That is why God pitied me and gave me the easier task: to be crucified." Thanks for posting this, Aarti. I can understand your initial reluctance! I am a Christian but I don't tend to enjoy Christian fiction - I find it cheesy and often a little uncomfortable - I don't like being preached to when I'm reading something for fun! I only read practical Christian stuff really. However this sounds interesting and I'd be willing to give it a go on the strength of this review. Books snob- I don't ever read Christian fiction myself, but I often have the idea that it would be cheesy or a bit heavy-handed. I didn't know a "practical" version really existed, but this seems like it would qualify! sumanam- Wow, that's so fascinating! You're obviously a very open-minded person and that just adds another layer of brilliance to your post! I have not read this book or seen this movie, although I do remember there being a lot of controversy when the movie came out. I am a Christian, but don't often read Christian fiction. I am not sure I would read this book because it sounds as though it veers a little sharply into territory that I might find uncomfortable or at the best, a bit strange. I am certainly not religiously prudish, but something about this book seems to turn me off a little. I am glad to have read the review though. I had never heard this book discussed with so much fervor before, and I always appreciate fresh insight. I think it's great to see a post so completely out of the realm of something I would normally read. I am intrigued! Great post! Zibilee: I understand your reluctancy regarding the book,it's hard to comprehend "Jesus" in a way other than, as described in "Bible". I'm agnostic, but wow, this post definitely has me wanting the Last Temptation of Christ. I find religion fascinating, especially when it comes to the cult of the saints (I did a paper on relics in the middle ages for a history class, have been intrigued ever since) so I'm not automatically turned off by a book with Christian themes, unless, well the book is Christian fiction with pioneer wife covers. Yuck. That said, I did really enjoy Lamb by Christopher Moore, which was about Jesus, but more comedic. When Iwrote this post I figured it would steer some controversy, but that's what makes it more readable..
another one for the wishlist. I HAVE to read this! Thank you for featuring this book, Aarti and Sumanam. This is one I probably wouldn't have given a second thought to before (I haven't even seen the movie), but Sumanam's comments really have me thinking I should give it a try. Like April, I am fascinated by religions of all kinds and I like books that offer a different perspective to an old familiar story. This is definitely not what people consider 'Christian Fiction' when they talk about that genre - in fact, most of the patrons who come into the library looking for that genre would be upset (to say the least) if I gave them this book. That said, even though I am a Christian I tend to avoid CF and TLTOC has been on my 'to read' list for awhile. Thanks for reminding me about this one.